If I’ve referred to Chicago as my disappointing lover, New York, as a metaphor, is an even flickler romp. Give me a flower and I’ll moon over whether I belong in the Big Apple or whether said apple is just not that into me. Because I want to love New York. I want to feel at home among the crowded chaos and late night fervor. I want fourth generation born and raised locals to look on me at any given coordinate, in any borough, in any season and at any time and think to themselves, yeah, she can stay here. She belongs. I suppose I never knew how difficult it was to manufacture a home. And because it had been some years since I last visited New York, I was really, really, excited to escape Boston and spend a weekend among friends who call the city home. As expected, mistakes were made. I rode in with Lauren and Betsy, two women that could be considered binary sign posts on a road trip bell curve. Lauren wanted to be on time (it was a cool 7 hour ride to Manhattan from Boston) and grew anxious with traffic and misinterpreted GPS signals and hour after passing hour. Betsy played the placater. Each traffic jam was justified. Lauren the driver was built up. Kimberly the passenger was built up. Everyone felt special and important and protected in those suspended seven hours. Lauren told stories of her life. I told tale. Betsy shed insight onto Betsy. With all this sharing and fluid driving I thought, yes. good. New York is magical.But I’ve never had a road trip that didn’t test my patience. And without their consent I’m certain I can say the same for Ms. Lauren and Betsy. So, to maintain pattern, there had to be a little road tremor. We were behind schedule. Disastrously behind schedule. I was slated to meet my friend in Harlem while Lauren and Betsy had dinner plans in Brooklyn. No one wanted to be late. Tensions were high and a decision was made to drop me off at a subway stop in Harlem. New York, see: fickle mistress. I think it was the high hopes. I often build up these places in my mind. Regardless I jumped out of the car in a huff and spent my first night in New York sullen and disillusioned. So it was a boon, simply a boon, that I stumbled upon a gaggle of New York women who comprised the company Surprise Industries. The premise was simple: pay a nominal fee for a “surprise” in a designated area of NYC. The surprise chaser is to select the neighborhood, pay the fee, and receive more cryptic clues via email as to where to go 12 hours before the surprise unveiling. Knowing so little of New York I selected TriBeCa at random. And I had absolutely no idea what to expect. It would be fair to say, however, that I expected something wild. Kim, A friend of some friends, who I never knew too well agreed to a surprise with me. We brunched like New Yorkers, and walked the city like New Yorkers (note: she is a New Yorker) and made our way to the “Surprise Location” in a hurry like fast-paced New Yorkers. Annnnnd, having found the location we were able to quickly discern that the surprise sweet spot was a pottery studio. Not only a pottery studio, but a pottery studio flush with children painting clay frogs and princesses and unicorns. It was too crowded for entry so we loafed outside in the sun until a very harried potter ran outside to ask if anyone was waiting from Surprise Industries. Kim and I waved our hands and were greeted with a humble, “SURPRISE!” from the studio representative. She led us inside, showed us the ropes and left us to paint some pottery. This wasn’t wild. One could even argue that this was wild’s disappointing lover. But, there was just something to painting in the mid-day sun. And even more in being given options. Think of it. Time! To sit still and create beautiful things. Time to take in a New York I never allowed myself an opportunity to covet. I thought the essence of NYC was fast and furious. And it may be. Even approaching the city we were tense with anticipation. But seated in a corner unit of a darling TriBeCa potters studio I took in New York slowly. I painted deliberately. And my landscape (a honey pot littered with 52 icons) proves a true likeness of the city. When one paints pottery they apply layers of glaze. Some make artful patterns, others more minimalist. 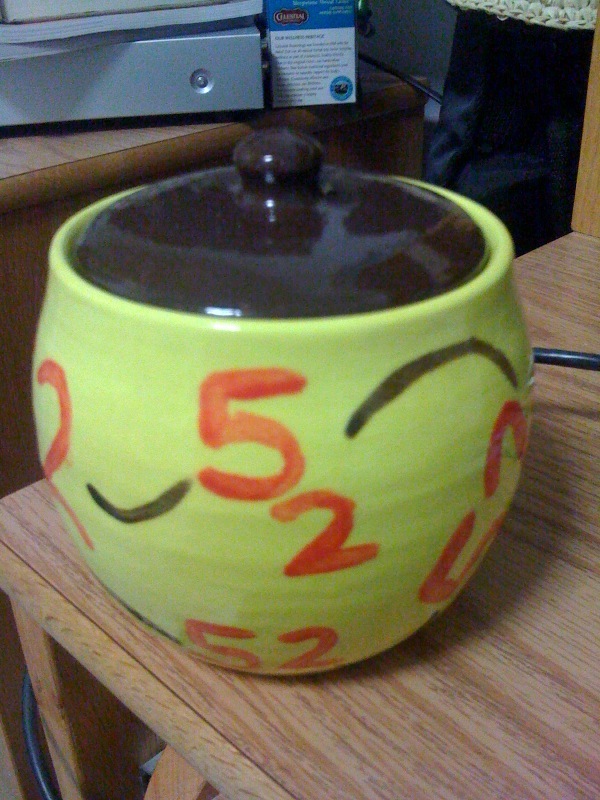 I think it’s important to note that my pot came out without cracks, and with the colors vibrant and in perfect pattern. It looks like it belongs. And wouldn’t you know, all the anxiety of all the road trips of all the days can just wash away when I decided to take a play from the Surprise Industry playbook and chill out on the ride home. Lauren told tale of her first kiss. Betsy asked after our ideal future plans. It took awhile, as trips home are wont to do, but there was no rush and the entry into Boston had me thinking, well, yes, this is good. This is magical.